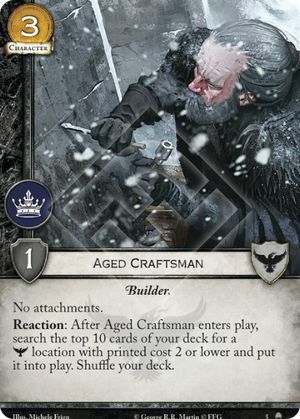 Aged Craftsman The Night's Watch Character Plot deck limit: 3. Builder. No attachments. 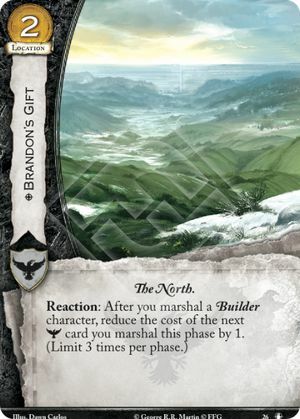 Brandon's Gift The Night's Watch Location Plot deck limit: 3. The North. Reaction: After you marshal a Builder character, reduce the cost of the next card you marshal this phase by 1. (Limit 3 times per phase.) 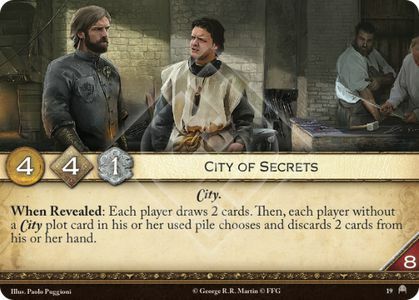 The Road to Winterfell #26 into play, you could then trigger the Gift. 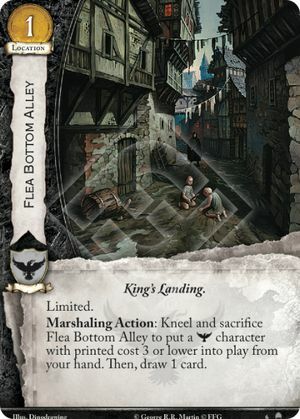 Flea Bottom Alley The Night's Watch Location Plot deck limit: 3. King's Landing. Limited. 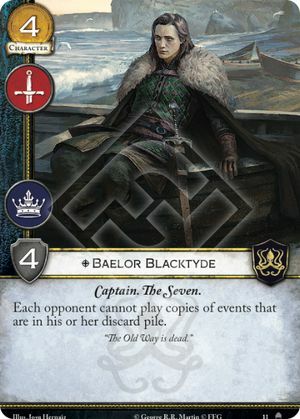 If you put a duplicate of a unique character into play, then the pre-then condition has not been met, you do not get to draw a card. 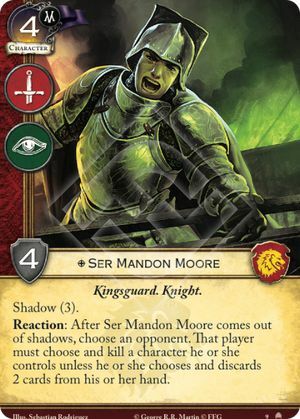 Ser Mandon Moore House Lannister Character Plot deck limit: 3. Kingsguard. Knight. Shadow (3). 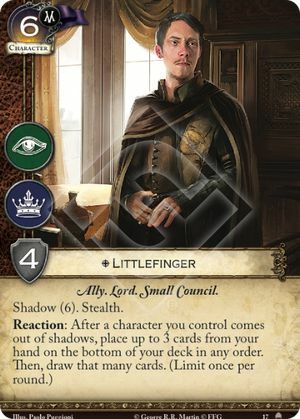 Littlefinger (AtG) Neutral Character Plot deck limit: 3. Ally. Lord. Small Council. Shadow (6). Stealth. 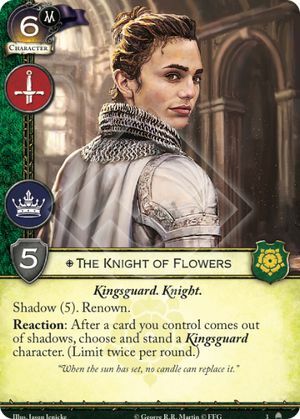 The Knight of Flowers (AtG) House Tyrell Character Plot deck limit: 3. Kingsguard. Knight. Shadow (5). Renown. 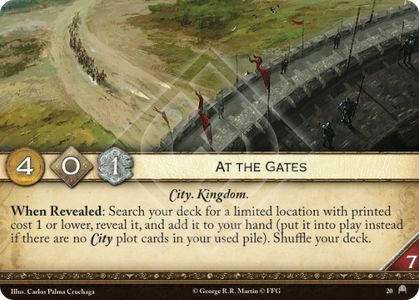 Gate of the Gods House Tyrell Location Plot deck limit: 3. King's Landing. The Seven. Limited. 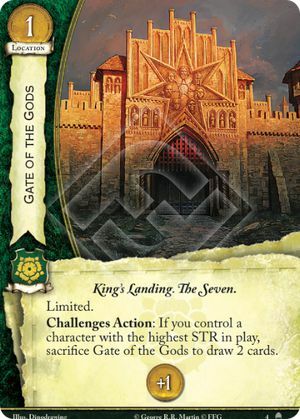 Challenges Action: If you control a character with the highest STR in play, sacrifice Gate of the Gods to draw 2 cards. Multiple characters can be tied for the highest strength. As long as you control one of them, you may trigger this ability. 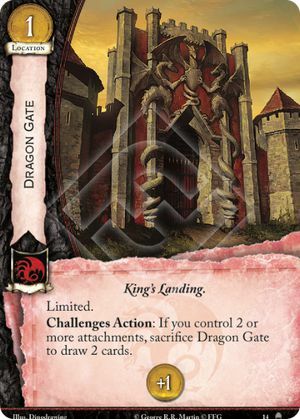 Dragon Gate House Targaryen Location Plot deck limit: 3. King's Landing. Limited. Challenges Action: If you control 2 or more attachments, sacrifice Dragon Gate to draw 2 cards. If an attachment you marshalled is attached to a card that’s under the control of your opponent, you still control the attachment. 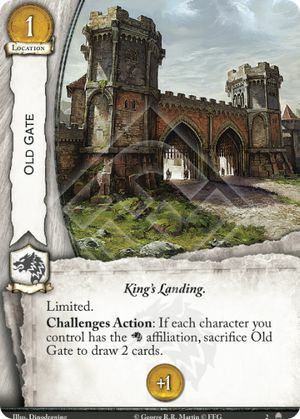 Old Gate House Stark Location Plot deck limit: 3. King's Landing. Limited. If you control no characters at all, you cannot trigger Old Gate’s ability.